Several years ago (2009? ), AK of Swell Vegan published her first zine. And when I say ‘zine,’ I mean gorgeous mini cookbook. While their aren’t any photos, the black cover with gold printed design is enough to sweep you off your feet. In the days before Pinterest and everyone outdoing one another with cute, indie crafts (put a bird on it? ), Swell Zine stuck out as a genuine gift of love and beauty. AK’s blog lends the same feel as well. I first found her (or she found me, who knows) back in the early days of my blogging (probably in 2007), and I fell in love with her simple, fresh take at vegan cooking. While so many vegan blogs focused on comfort food back then, hers embraced the vegetable in its myriad of forms, and each recipe seemed to be tinted a bit by her Nordic roots. Even now, I’m amazed at the flavor profiles she dreams up–Strawberry-Rosehip Soup, Orange-Coconut Water Keffir, or Coconut-Red Curry Roasted Vegetables. For awhile she closed down the site, but then brought it back and she doesn’t post as often as she used to, but each new recipe is a treat. Word on the street is that there might be a new zine coming out in the future and I hope that’s the case because AK’s first is a masterpiece. Only 24 pages long, the zine covers a range of recipes from appetizers to main courses, an in-depth look at tempeh and tofu, and then some desserts. I’m ashamed to admit that this is the first time I’ve actually cooked out of it, but I’ve read all the recipes and they look solid. Mole-Roasted Cauliflower, Spicy Tahini Stew, Orange-Glazed Tempeh, Sweet Potato-Cranberry Scones, Lemon Zucchini Bread. Each recipe puts the grain or protein or vegetable first. No fake cheese or faux meat here. Just simple whole foods elevated to a new level. Yesterday, the weather was downright wintery. A high of 50 degrees (F) and raining, it was a 180 from the warm, early autumn days we’ve been enjoying. 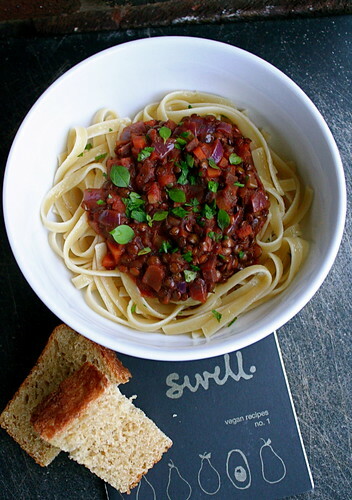 Though I’d planned on making this Lentil Bolognese later in the week, I knew last night was the evening for it–a warm, hearty pasta sauce, fresh baked bread on the side (yup, carb me up), a glass or three of red wine. Not to mention the tiny fact that our furnace isn’t up and running yet. It’s downright nippy in the house. 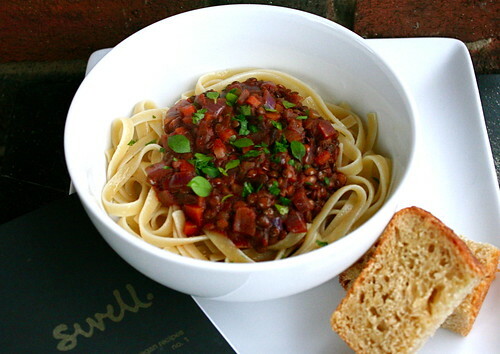 Absolutely the best time to cozy up with a bowl of lentil bolognese! The recipe is simple but packed with flavor–lentils, tomatoes, your basic mirepoix, red wine, and a few spices and herbs. Nothing fancy, just simple, earthy food. The only issues I had with the recipe were the cook time–I cooked the lentils for well over an hour, and they were still a little undercooked–and, subsequently, the amount of liquid–I more than tripled the amount of broth and red wine in the recipe in order to cook it longer. But those are simple issues that are easy to fix. Simple yet so rich, this sauce made my night. It made me feel as cozy as if the furnace were running, as if I could turn on our gas fireplace and enjoy the glow. But I know I’ll be making this again later in the season when it truly is winter, maybe when there’s snow on the ground, and I know it will be exactly the right thing then too. Heat olive oil in a medium-sized pot over medium heat. Add onions, carrots, and celery, and cook until soft and the onions begin to caramelize. Add garlic and lentils and stir a minute or two more. If the sauce is too watery for your liking, cook it for a few more minutes uncovered to evaporate some of the liquid. Stir in parsley and serve over your favorite pasta with a sprinkle of smoked paprika. We just got our first bit of cold weather, so you posted this just in time. Can’t wait to try it! Eeek – you’ve been hit by this crazy shift in weather, too! And you read my mind – literally – I’ve been craving lentil bolognese but didn’t want to dig out the recipe I make over and over and over again . . . I’m making this. Probably tonight! You’re convincing me that I need to collect more cooking zines! I only have a few, but they’re all little gems. (Like the lettuce! Er, except made of paper…) Using lentils in a bolognese is definitely an idea I can get behind. 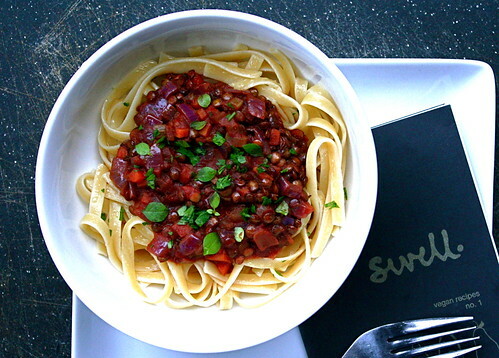 I love a good lentil bolognese especially one made with french lentils! This looks so lovely and perfect for a cold evening. Our weather doesn’t know what it’s doing either, we had a couple of warm days last week and now it’s back to cold again halfway through our Spring. Beautiful! When I saw the sauce I assumed there were beets in it! I hope you get your furnace up and running soon – it’s getting pretty chilly! I have this zine too but I had to double check because mine is a different colour! Anyway, it is the same and I am also ashamed to say I have not used it enough. This dish looks amazingly good and just what I need right now! I hope you warm up soon, it’s meant to me warming up here but it seems to have gone back to winter! Lentils, wine, pasta – what’s not to love about this dish? I hadn’t heard of Swell Vegan, but what a pretty blog with tons of creative ideas.